In "Family Album," Gonkar Gyatso explores contemporary Tibetan identity through a series of large-scale photographs depicting members of a single family living in Lhasa. Photos courtesy Gonkar Gyatso. The Michael C. Carlos Museum presents “Family Album: New Works by Gonkar Gyatso in Collaboration with Photographer Zhadui” through Nov. 27, with several events scheduled this month. 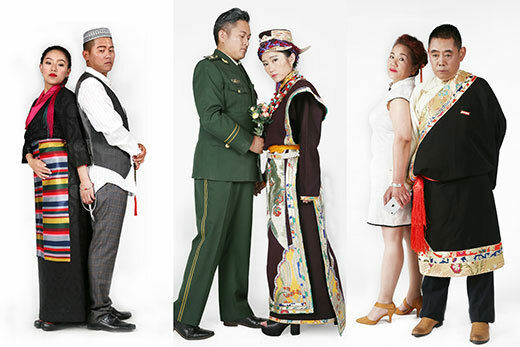 Gyatso composes the photographs as a family album, revealing the complex and varied roles of each family member. He examines the ways in which Lhasans’ wardrobes and postures gracefully adapt to professional, familial, religious and holiday settings. These multiple transformations in outward appearance may also suggest inner states and the shifts between them that Tibetans navigate on a daily basis. In 2003, Gyatso completed his first series of photographs, “My Identity,” in which he explored his own personal ideological shifts across the political, social, and national boundaries that constitute “Tibet.” “Family Album” is Gyatso’s second major photographic project. The photographs were taken in Lhasa in collaboration with photographer Zhadui. One of the few artists from the Tibetan diaspora to gain international recognition, Gyatso’s work often juxtaposes Buddhist iconography with the ephemera of pop culture, bridging Eastern and Western cultures in new and engaging ways. Gyatso’s work has been exhibited and collected in galleries and museums around the world, including the Metropolitan Museum of Art, the New York Public Library, the Rubin Museum of Art in New York, and the Museum of Fine Arts in Boston. He participated in the 53rd Venice Biennale, the 6th Asia Pacific Triennial in Brisbane, and the 17th Sydney Biennale. Gyatso will set up a studio space at the museum where members of the community can make this traditional Buddhist offering made from molded clay. Typically left as offerings in the foothills of the Himalayas, this practice is believed to result in the accumulation of merit and to aid in the removal of obstacles to spiritual practice. “This residency gives us an opportunity to translate a ritual that has taken place in the Himalayas for hundreds of years and recreate it here on campus, bringing together students, faculty, staff and the Atlanta community," says Elizabeth Hornor, director of education at the Carlos Museum. At the end of the week, hundreds of these small clay images of Buddhas and other meditational deities will be enshrined in the Baker Woodland behind the Carlos Museum where they will naturally disintegrate over time. For the full schedule of events during his residency, visit the website. On Sept. 28 at 7:30 p.m., Martin Brauen, chief curator emeritus at the Rubin Museum of Art, will explore the uses of sacred Buddhist images and ways in which contemporary artists are depicting and transforming Buddhist symbols in a lecture titled “Buddha in a Shopping Bag."